The main island of the Azores, São Miguel still maintains a unique charm where life is unhurried. It’s a great island for a first visit with easy flight connections, a wealth of things to see and activities to do, and some of the Azores’ most spectacular volcanic scenery. From quiet fishing villages to remote crater lakes to boiling pools, this island has it all. It is the largest island and prides itself on its green, flower-carpeted scenery. You will explore the numerous lakes that will capture your heart and craft visual poetry. Discover Vale das Furnas, a luxurious garden at the bottom of the vast crater, where hot water streams bubble. Inland, discover the idyllic Terra Nostra Park where exotic tropical species mix happily with those from colder climes. 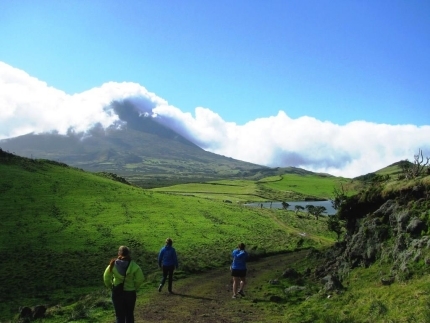 Join this walk through Sao Miguel and its volcanic regions. Ideal for those you want to explore a unique destination. It is a must for anyone who enjoys walking through rich green pastures, witnessing aqua marine lakes and experiencing mild summer temperatures perfect for an outdoor adventure, this eight day tour is a great way to see the highlights of Sao Miguel on foot.